The attorneys at Hollis Wright are currently investigating claims involving the use of the new generation of anti-coagulants, Pradaxa (Dabigatran), Xarelto (Rivaroxaban) & Eliquis (Apixaban). Recent studies have indicated that the use of these new generation anti-coagulants may be related to serious brain, gastrointestinal bleeds and other bleeding events that can result in extended hospital stays or even death. If you or a loved one has taken one of these anti-coagulants and experienced either an extended hospitalization for bleeding or a fatal bleeding incident, please contact the attorneys at Hollis Wright today. Pradaxa is manufactured by Boehringer Ingelheim and was approved in 2010 by the U.S. Food and Drug Administration. 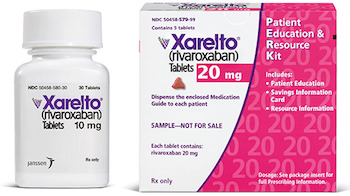 Xarelto was developed by Bayer HealthCare and manufactured by Janssen Pharmaceutical and was approved in 2011 by the U.S. Food and Drug Administration. Eliquis is manufactured by Pfizer and Bristol-Myers Squibb and was approved in 2012 by the U.S. Food and Drug Administration. These new generation anti-coagulant medications have been widely prescribed to prevent blood clots in patients suffering from atrial fibrillation (irregular heartbeat); deep vein thrombosis (blood clots deep within the body); pulmonary embolism (blood clots in the lungs); stroke; and patients who have recently undergone a knee or hip replacement surgery. However, since the introduction of these new generation of anti-coagulants there have been numerous severe adverse event reports concerning their use in patients. The adverse events have included things such as internal bleeding or gastrointestinal bleeding, brain hemorrhaging, kidney bleeding and even death. Prior to the development of these new generation anti-coagulants, Coumadin (Warfarin) was used for years in patients to prevent clotting. While Coumadin carries the risk of gastrointestinal bleeding, the rates of occurrence appear greater in those using these new generation anti-coagulant medications. However, unlike Coumadin, these new generation anti-coagulant medications have no antidote to reverse their anti-clotting properties. Therefore, in the event a person starts to severely bleed internally or externally, it can be extremely difficult, if not impossible, for a physician to reverse the anti-clotting effects in time to save a person from bleeding to death. Unfortunately, the lack of an antidote has led to serious injury and even death in individuals who only suffered minor injuries initially due to the inability to stop internal bleeding once it starts. If you or a loved one has taken one of these new generation anti-coagulant medications and experienced either an extended hospitalization for bleeding or a fatal bleeding incident, please contact the attorneys at Hollis Wright today.